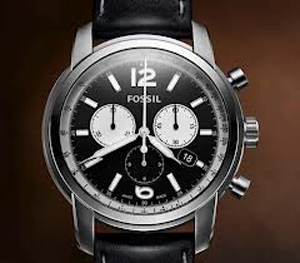 Fossil Swiss made.American fashion-brand is a collection of ... expensive watches! First of all, the impressive new products RRP – $ 895-995 for Automatic and $ 695 for the quartz models. At a cost of clock suddenly caught up with models of Swiss brand Zodiac (another brainchild of Fossil Inc). A closer look of what constitutes such a price. Housing steel or gold PVD-coated. Diameter – 38mm. Cherished inscription “swiss made” on the dial promises unmatched Swiss quality. Contrast 12-hour markings on a black or blue background. The back cover is transparent, with mineral glass, through which can be seen decorated with Geneva stripes Swiss movement STP-1-11) to 26 stone, with a carrying frequency of 28,000 vibrations per hour and a power reserve of 46 hours. The model comes to vintage leather or steel strap. Water-resistant to 50 meters. Shell diameter of 43mm already. At around “3:00” there is not only a date aperture, but also the day of the week. Background Dial: black, blue or white. Back cover blank. Inside is a Swiss quartz movement Ronda 715. In other characteristics coincide with automation. Quartz chronographs with tachymeter has the largest diameter – 45mm. Date aperture at around “4:00.” Inside is a quartz Ronda 5030.D.